The highest steel beam of the new Tata building is hoisted above a crowd on the Business School campus on Monday. It was painted white and adorned with dozens of signatures and a small pine tree according to a Norse tradition adopted by steel workers in "topping off" ceremonies. With Harvard Business School administrators and construction workers looking on, the ceremonial hoisting on Monday morning of the highest steel beam of Tata Hall marked the start of the next phase of construction of the building that will host participants in the school’s Executive Education programs. At the traditional “topping off” ceremony, attendees were invited to sign the beam, which was then lifted by a crane and set into place by two construction workers atop the structure. Before the ceremony, the building’s construction workers also signed the beam. 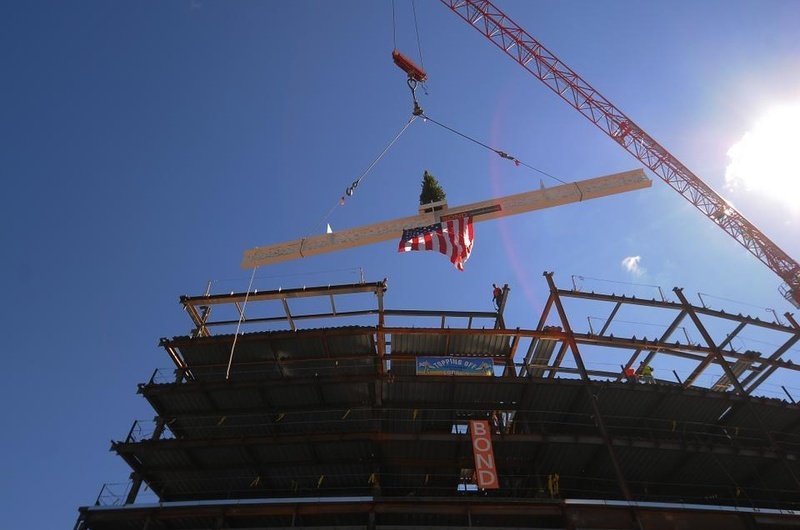 As part of the celebration, the beam was decorated with an American flag and a small tree intended to serve as a reminder of the environmental impact of new construction. Tata Hall, which broke ground in December 2011 and is expected to be completed in December 2013, will include 179 new bedrooms and two classrooms, according to Andrew F. O’Brien, the chief of operations at the Business School. The total construction costs are estimated at $100 million. Situated at the northeast corner of the Business School, Tata Hall will face the Charles River and complete an Executive Education quadrangle. Each year, close to 10,000 students enroll in the school’s Executive Education programs. At the ceremony, Nohria recognized the work of former dean Jay O. Light in securing a $50 million gift from Ratan N. Tata, the chairman of the Indian industrial conglomerate Tata Group. “It’s thanks to him, working with Mr. Tata, that we have this opportunity today,” Nohria said. Tata attended the School of Advanced Management Program, an executive education program at the Business School, in 1975. In his remarks, Nohria spoke of the excitement that Tata, who was unable to attend Monday’s ceremony, has expressed for the project. When Nohria met with him this summer, Tata immediately placed the scale model of the building on a prominent position on his mantelpiece. The ceremony also included remarks from Robert C. Murray, the president of Bond Brothers, the construction company in charge of the Tata project. The Everett, Mass. based Bond Brothers has a 60-year history with Harvard, most recently in the construction of the Northwest Building science complex, completed in 2008. Although the final steel beams will soon be in place, the steel workers will continue to do detail work on the building for a few more weeks before other sub-contractors begin the next steps on the building’s construction. As of April, construction on the project was ahead of schedule due to the mild winter. Still, administrators say that they are planning to meet the original 2013 completion date. “We’re about 30 percent done, so we still have a lot of the building to do,” O’Brien said. —Staff writer Brian C. Zhang can be reached at brianzhang@college.harvard.edu.